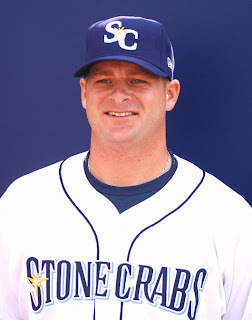 Stephen Vogt, Rays minor-league catcher, graciously agreed to answer a few submitted questions for RaysProspects.com. I want to thank Stephen for giving a moment of his time to help out our site, and everyone from RaysProspects.com wishes him the best of luck in 2010! 1. How closely do the guys in the minors follow the big league team? We follow them fairly close, we watch whenever we can. I have found that I tend to just follow the guys I have gotten to know over the last few years. 2. Can you describe your approach at the plate, particularly what you are trying to do with your legs and your hands? My approach is middle-away, I want to let the ball travel on me and get close to me. With my legs and hands, I want to make sure I have flexion in my legs, which gets them into an athletic position allowing them to come through the baseball. As for the hands, make sure they are relaxed and in a good position with the bat angled up at 45 degrees making it ready to come straight down through the baseball. Short to it and long through it. 3. Stephen, you have played several positions as a pro. I am sure that as a team guy, you will do your best to do whatever helps the team, but ideally, would your development be better served by sticking at one spot? Not necessarily. While earning a starting spot in one position would be great and I would not complain whatsoever, the ability I have to play outfield, 1st, 3rd and catch is an asset in that I will be able to use to get into the lineup 6 different ways. 4. Stephen, your scouting report at Baseball Cube reads as follows: Power: 32 Batting: 84 Speed: 38 Contact: 96 Patience: 79 Do you have any quibbles with this report? Which of these ratings is the most important to your development going forward? I would like to think my speed is higher than a 38! I might be a catcher but I can run a little bit. I believe they are all important, I think the one that I can definitely improve on is power, it is the last aspect of the swing to develope for most baseball players. These are all equally important in my development, but patience and contact are the most important in my mind. 5. What has life on the road been like as a Rays minor leaguer, and has it been hard to change your regular season environment every year? It's been amazing. Getting to live in 3 different states and experience 3 completely different areas of the country has been a blessing. Being married I have a different perspective than most, but my wife and I have enjoyed each place we have lived and love the fact that we get to move every 6 months. The Minor League lifestyle can be tough at times and exhausting, but overall it is the greatest job a man can have. We get paid to play our favorite game, I wouldn't want to do anything else. Thanks for this! I hope there are more interviews in the future! Glad you enjoyed it. I will definitely see what I can do for future interviews, I'm friends with quite a few guys so it's certainly a possibility! Good interview, seems like a nice guy. Also seems like he's got his life together, real mature. He had pretty good seasons in 07 and 08, one thing that stands out is that for his pro career he has 80 walks and only 83 strikeouts. I always thought of him as primarily a catcher, but in 174 games he's only caught 26. Also suprised about his comment about playing 3B, he's never played 3B in a game in the minors. Hope to hear more from him in spring training or during the season. Most underrated player out there, and a great guy. Hope he continues to get more attention, though it's been incredible to see him play at this level. Stephen is a phenomenal person. Great athlete. Good heart. I can't wait to see him go all the way. My 14 y/o son got to hit under Stephen's guidance in Lacey, WA over the winter. He is a Super guy, Great teacher & the kids really liked him. Good Luck Stephen.